Our Three Bottle Gin Gift is perfect for any gin lover. 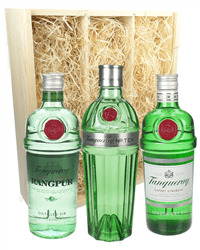 Choose from our range of Three Bottle Gin Gifts including gins from Tanqueray, Bombay Sapphire, Hendricks, Chase and many more. 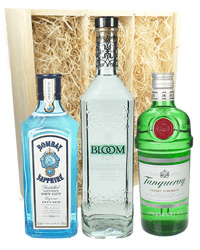 Select from three of the same gin brands or choose a variety of gins. Order online or by phone and we will deliver to the address of your choice, beautifully packaged in a wooden box with your special gift message.